This beautiful championship dress with fantastic stage presence is reluctantly being sold due to a growth spurt by my daughter. This dress was made for my daughter in October 2009 by a London based dressmaker who designs and makes dresses to the highest of standards. This is a modern dropped waist tennis skirt style with 12 panels. The bodice of the dress is navy blue velvet and the stiffened tennis skirt is a deep red silk. The lining under the skirt and in the panels is blue satin with a complimentary spotted material underneath and the embroidery on the dress is red, blue, white and green. 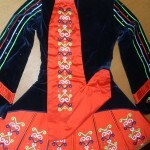 There is red piping around the neckline and cuffs. The dress is adorned with over 700 hundred Swarovski crystals (of different sizes) that provide amazing sparkle on stage. This dress is fully lined and made to such high quality it looks as beautiful on the inside as it does on the out! An embroidered and embellished soft cape is also included in this auction. The dress is in immaculate condition with no tan marks on the skirt. There is slight creasing on the bottom of the 2 back panels, this is only due to kicks and is not noticeable. The dress has been stored flat in a smoke/pet free home and has only been worn at monthly competitions, where she has received many compliments and prizes. 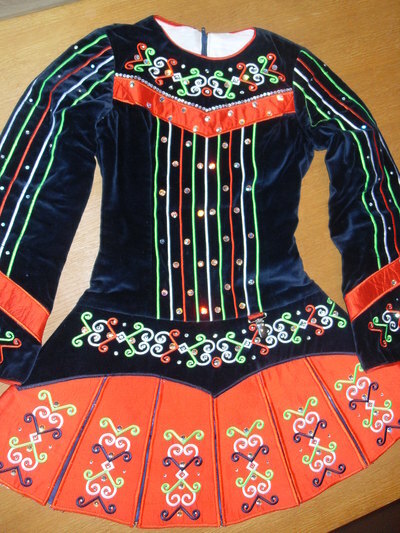 My daughter wore this for the last time at a feis on Saturday and received lots of compliments. 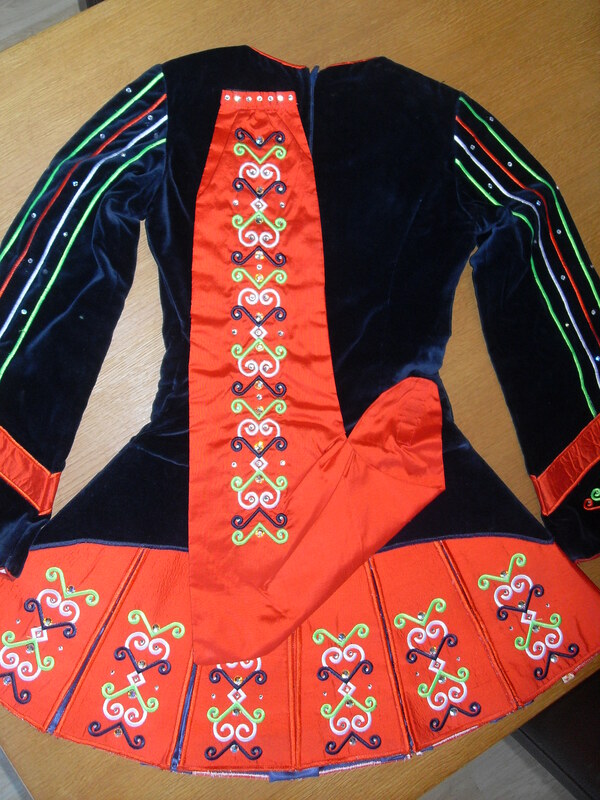 This dress is a traditional style with a modern twist, which is always a hit with any adjudicator! Sellers always say the pictures do not do the dress justice but this really is the case with this dress! If you are in the Berkshire area you can happily try this on. Asking Price: Â£370. Shipping costs not included. Sale is final.